Bro. Yesanna founder and President of Hosanna Ministries has been promoted to Glory today (8th August 2012) evening at 7:30 PM. His ministry is famous for Feast of Tabernacles (Gudarala panduga) held every year in the first week of march where more than 15 lakh people gather. His meetings are famous for keeping the Guest Speakers name as Holy Spirit God. Audio songs of this ministry are top selling gospel albums in India along with Father S.J Berchman's Albums. Brother has been suffering from ill health from few months. Bro. Yesanna - the Founder and President of ‘Hosanna Ministries’ is a God chosen vessel. He is endowed with several Spiritual gifts. He has been in the ministry since 40 years as a well known Preacher, Pastor, Singer and lyricist. 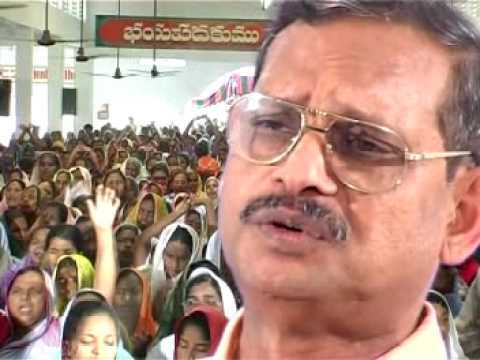 He has planted more than 400 churches in Andhra Pradesh, Tamilnadu, Karnataka, Madhya Pradesh, Maharashtra, Goa and also one in South Africa. He is being used mightily by God both nationally and internationally. But his beginning was very humble which began in the midst of hardships and difficulties. He was born in 1947 in Nellore district, Andhra Pradesh to Tippalapudi Narasimhulu and Kamalamma. His father was a devoted Hindu whereas his mother Kamalamma was a Roman Catholic. Each time she delivered a baby; and in three days time the child would die. In similar way she had lost three of her five children. After some time she was admitted in St. Joseph General Hospital Santhapet, Nellore District to deliver her 6th child. A baby boy was born to her on March 19, 1947. As the child was struggling to survive, on the 3rd day she went to Bishop William Bouter and poured out her anguish and grief before him. The bishop prayed for the boy and kept his name ‘Yesanna’ and prophesied that the boy would become a great man of God. When Bro. Yesanna was 10 years old, he was possessed by demonic spirits and wandered in the streets of Nellore without having proper conscious mind. Due to this, his studies were terminated from 6th class. For Seven years he roamed as a mad man, vomiting blood, sleeping on footpaths, railway platforms and spent a very miserable life. In some occasions his condition forced him to eat the food at dust bins and garbage. On the D-day 15th February, 1964, as Yesanna was wandering on the streets,without his knowing he was led to a Christian cottage meeting place enrouting his home.He was unmindful of what was happening to him there then.He went and sat inside and heard some worship songs. After the meeting was over, a very bright light shone on him while he was enrouting home at 11 PM .He saw the face of the Lord Jesus Christ in that dazzling light and got healed immediately and became a normal person. That same night he went back to his home after seven years with sound mind. The next day he visited the Pastor where he went the previous night. The pastor explained clearly to Yesanna that Only the God of the Bible cured him and pointed two references from the Holy Bible, they are “For the Son of Man came to seek and to save what was lost” - Luke 19:10 (NIV) and "Come to Me, all you who are weary and burdened, and I will give you rest” Matt.11:28 (NIV). The Pastor gave him a Bible copy and from that time onwards Yesanna began to read the Bible continually, fasting and praying regularly. In 1966 when he was 19 years old, God called him for the full time ministry. Being obedient to the call for God's service, Yesanna left his home, family and ministered in ‘The Pentecost’ church for several years. Later in 1977, he started a small church in a hut in Lemalle a remote village, Guntur District, Andhra Pradesh. He had gone through many trials, tribulations and faced severe poverty in the early stages of his ministry. But God never left him alone in that condition. The ministry began to grow and several new churches were planted in various places. Like Job said “when He has tested me, I will come forth as gold”. Now Bro. Yesanna is being used mightily by God both in India and abroad. He had visited and preached in South Korea, Holy land (Jerusalem), Italy, Egypt, Singapore, Malaysia, South Africa, America, Canada, Japan, Sweden, Dubai, Kuwait and many other countries.